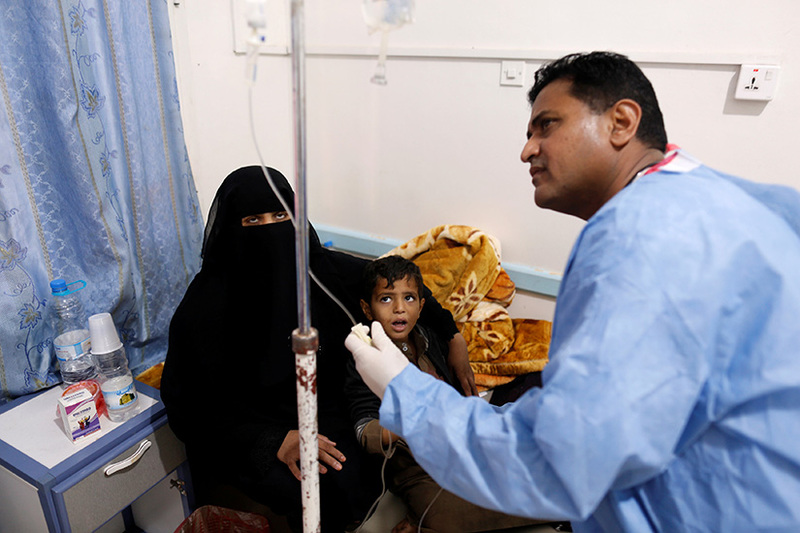 A doctor treated a child at a cholera treatment center Oct. 3 at a hospital in Sanaa, Yemen. Aid agencies and Catholic officials are sounding the alarm on Yemen’s spiraling humanitarian crisis, calling on the combatants to end the war and make badly need assistance available. AMMAN, Jordan — Aid agencies and Catholic officials are sounding the alarm on Yemen’s spiraling humanitarian crisis, calling on the combatants to end the war and make badly needed assistance available. “A war is ongoing in Yemen, but the big world does not seem to be very interested,” said Bishop Paul Hinder, apostolic vicar of Southern Arabia, which includes Yemen. “There are innumerable people internally displaced because they fled from the war,” he told Catholic News Service. “A wonderful nation with a cultural tradition (spanning millennia) is about to be destroyed,” warned Bishop Hinder, decrying the lack of international resolve to end the conflict tearing Yemen apart. Some 1.8 million Yemeni children are malnourished, making them more vulnerable to disease, the U.N. children’s agency, UNICEF, reported. These children include nearly 400,000 whose lives are at risk from severe acute malnutrition. About 68 percent of the population lacks access to basic health care. Johan Mooij, CARE International’s Yemen country director, said there is currently only enough food to sustain the country’s population for two months. Meanwhile, Yemen’s cholera outbreak — the worst in the world — is accelerating again, with roughly 10,000 suspected cases now reported per week, according to the World Health Organization. Approximately 30 percent of suspected cases are children under age 5, the agency added, saying that cholera can kill a child within hours, if left untreated. “The international community cannot ignore anymore the tragedy going on. The warring parties have to be pressured in order to sit around the table and to make humanitarian help possible for all people in need,” said Bishop Hinder. In June, escalating violence in and around Yemen’s port city of Hodeidah, the main humanitarian hub, led to hundreds of thousands more people being displaced and vital routes for aid and supplies being closed. Recently, there has been an increase again in airstrikes on Hodeidah, jeopardizing the lives of noncombatants. The United Nations has renewed its efforts to end Yemen’s war with a plan that calls on the Iranian-backed Houthi rebels and the internationally recognized government of President Abed Rabbo Mansour Hadi, supported by Saudi Arabia and the United Arab Emirates, to agree a peace deal under a transitional governing body. “With the humanitarian crisis (in Yemen) plummeting to new depths, all efforts must be focused on securing a cease-fire,” said Frank McManus, the New York-based International Rescue Committee’s country director in Yemen.